How does something move when it’s falling through the air? What exactly happens when you throw a ball up and it falls back down? Before we leave this chapter behind and start getting into the real meat of physics, I’d like to discuss one more topic: falling objects. This will complete our picture of simple motion and set the stage for the chapter on Newton’s Laws. Imagine that you hold a ball in your hand. Picture one that you feel familiar with — a baseball, or a tennis ball, or your dog’s little red plastic chew ball (better yet, pick up an actual object and use that instead). 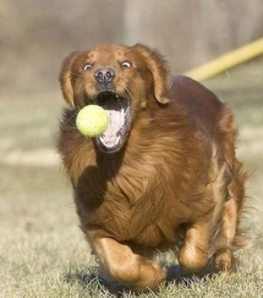 Now imagine holding that ball out in front of you and letting go. Warning: the presence of an actual dog may affect the outcome of this experiment. If you’ve read along carefully so far, you should feel quite confident in describing the ball’s motion: it starts with no velocity, then accelerates downwards. Easy. What happens in a car when you push on the gas pedal or step on the brake? As a physics teacher, I blame a lot of my problems on cars. People spend hours every day in cars of one kind or another, and they’ve developed strong ideas about the relationships between the gas pedal, the engine, and the car’s movement. I will soon try to convince you to think differently about those relationships, but for now I’m going to make use of what you already know. Fig. 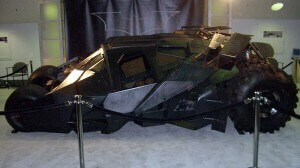 1: The Batmobile, which doesn’t break the laws of physics, but certainly bends them. Speed is the easy one. If you want to know how fast a car is going, just glance at its speedometer. Unfortunately for high school physics students, however, it is quite easy to complicate even such a simple concept as speed. This practice goes all the way back to pre-Socratic Greece, when the philosopher Zeno asked how a flying arrow could both occupy a space and yet also be in motion, a question which eventually forced mathematicians to give up and invent calculus. Nevertheless, for the purposes of this site, “speed” (or “velocity”) means nothing more than how fast a thing is travelling. We’re going to have to be a bit more careful about acceleration, though. Not only is the physics definition of acceleration slightly different from the everyday one, it also represents our first tricky concept — one that you might find difficult to wrap your head around. It may seem strange to begin a site about the mysteries of physics with a chapter on motion. After all, moving is something we do every day, all of the time. It doesn’t usually seem very mysterious. You may think that you are sitting still right now, staring at your computer, possibly with your legs propped up on the corner of your desk or a small, obedient child. But that is not the case. 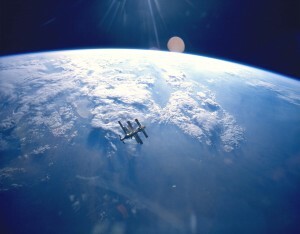 In fact, just beneath you there is a fantastically large piece of rock which is spinning around in space. Being on the surface of this hunk of rock, you are moving with it — at speeds of up to 1,674 kilometers per hour (or 1,040 miles per hour). That is a few hundred kilometers per hour faster than the speed of sound. Unless you are reading this in space, in which case: awesome. And the planet does more than just spin — it’s also orbiting the sun. It may take a while to complete one full orbit (one year), but in that time it has gone a long way — almost a billion kilometers. We’re moving around the sun at a speed of over one hundred thousand kilometers per hour.